Nothing beats the feeling of a cool breeze on your face as you’re zooming down Oklahoma roads on your motorcycle. But as the owner of a motorcycle, there are some laws and safety tips you should be aware of. These laws are implemented with your best interests in mind, as they are implemented to ensure you and any of your passengers are safe while your motorcycle is being operated. Unfortunately, not everyone follows automobile laws, which is why there are personal injury lawyers in Tulsa. If you find yourself in a motorcycle accident or with some other type of potential personal injury claim, don’t be afraid to reach out to our personal injury lawyers at The Edwards Law Firm in Tulsa Oklahoma. We have decades of experience helping Oklahoma residents with their legal issues, whether that’s navigating the personal injury legal process or simply explaining Oklahoma motorcycle laws. Contact us today for a free case evaluation. 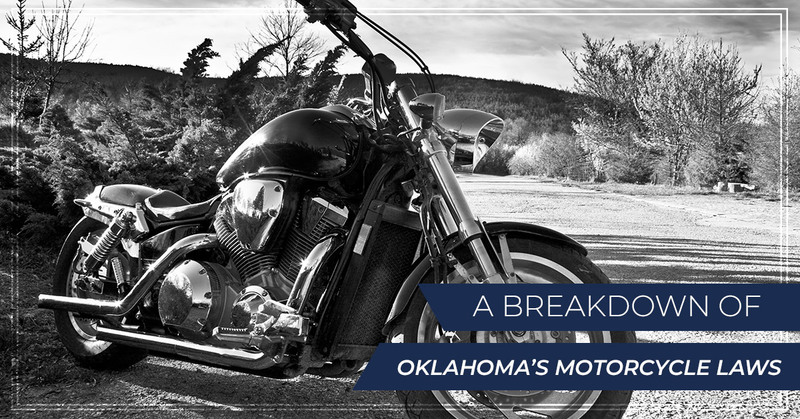 In this blog post, we’ll provide a breakdown of Oklahoma’s motorcycle laws. We’ll let you know what is absolutely required in this state as well as other rules that are required in other states but aren’t stated in Oklahoma law. 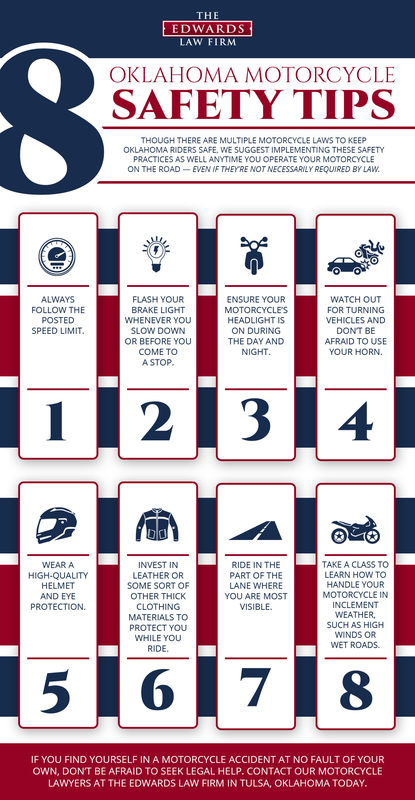 When it comes to safely driving a motorcycle in Oklahoma, there are several rules that have been implemented to prevent serious injuries or fatalities from occurring on our roads. You must be at least 14 years old to get a motorcycle-only license and 16 years old to earn a motorcycle endorsement. You must have an “M” endorsement on your driver’s license in order to operate a motorcycle legally. You must have a safety helmet on while operating a motorcycle if you are under 18 years old. You must have eye protection on unless your motorcycle is equipped with a windscreen. You must use your headline during the daytime. You must have a passenger seat and footrest if you’re carrying a passenger. You must have left and right rear view mirrors. Motorcycle licenses and endorsements from other states are accepted in our state. Your motorcycle’s handlebar height must be no higher than your eye level. There are other questions you may have about Oklahoma motorcycle laws that aren’t quite as definitive as the laws we listed above. There is no age limit for the passengers on your motorcycle. There are no restrictions on having speakers in or on your helmet. There are no restrictions on radar detectors. There are no laws that say you can or cannot have two motorcycles operating in the same lane. When you keep these Oklahoma motorcycle laws in mind, you should have a higher chance of enjoying a safe and happy drive on your motorcycle! If you’ve recently been in a motorcycle accident at the fault of another individual and are experiencing personal injuries from the collision, seek justice and legal assistance from our personal injury lawyers in Tulsa. We strongly believe you shouldn’t have to suffer quietly because of somebody else’s mistakes — seek the compensation you deserve for your damages. No matter what your personal injury claim might be, we provide free case evaluations to determine if you have a legitimate case. For more information about our legal services or to schedule a case evaluation, call us today at (918) 221-0516 or at our toll-free number at (888) 600-9836 during business hours. You can also fill out our online form to get in contact with our personal injury lawyers about Oklahoma motorcycle laws or other legal information.